08-Aug-2011 -- This is the 3rd out of 6 confluences that we reached on a 3-week trip through Honshū and Hokkaidō. The story starts at 36°N 140°E. The previous report is 37°N 140°E. From Niigata (新潟市) we took a ferry to Hokkaidō (Tomakomai City) and rented a car for 5 days. We were not able to book any vehicle longer than that because the Japanese holidays would begin on 12 August, which meant that all rental cars were already reserved. Now Elionora and I discussed how many confluence points we would visit during those 5 days. We agreed that we would attempt as many confluence points as possible on the first day and I promised that the remainder of our vacation in Japan would be confluence-free even if we would pass by a confluence up to 5 meters, we would not stop for it. So, on confluence day, we got up at 4:15 AM in Tomakomai (it was already daylight) and were on the road at 4:50 AM. We did have a navigation device, but we were not capable of entering addresses in Japanese and the device didn’t have an English version. Alternatively, we could enter telephone numbers as the navigational endpoint, but what on earth is the telephone number of a confluence? At 6 AM we reached the nearest point on a road, which was directly opposite a temple at a distance of 400 m. The hike lead us through tough wilderness: the ground overgrown with short bamboo (Sasa senanensis) and the slipperiness plus steepness of the hill made the hike tenuous. 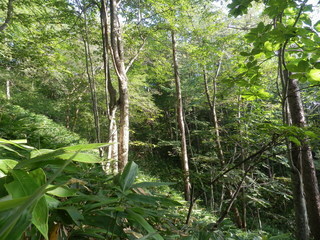 The confluence is on a steep slope covered with sasa bamboo grass on the ground and buckeye trees all around. We were wet, dirty and exhausted when we reached the car an hour later. Time starting the hike: 6:00 a.m.
Time at the CP: 6:30 a.m.
Vegetation: ground covered with Sasa senanensis (bamboo grass), forest of buckeye trees. We continued further east where the story continues at 43°N 143°E.